George Duke a well-known jazz musician, was born in San Rafael, California, and reared in Marin City, a working class section of Marin County. He began his piano studies at age seven, absorbing the roots of Black music in his local Baptist church. "That's where I first began to play funky. I really learned a lot about music from the church. I saw how music could trigger emotions in a cause-and-effect relationship." George and a young singer named Al Jarreau formed a group which became the house band at San Francisco's Half Note Club. The George Duke Trio which emerged from those sessions was soon burning a path of creative excitement through the jazz world. It included a major European tour and an appearance at the Newport Jazz Festival. The group's first gig in a rock-oriented venue came in early 1969. Soon, ushered in the West Coast counterpart of the Eastern fusion revolution sparked by Miles Davis, The Mahavishnu Orchestra and Weather Report. Before '69 was out, George joined Frank Zappa (as he put together a new "Mothers Of Invention" lineup) and toured for an entire year. In 1973, George rejoined Zappa and brought Jean-Luc Ponty with him. That band stayed together for the next three years, until Duke left to join forces with drummer Billy Cobham. Together, they formed a powerhouse jazz fusion unit even more popular and influential than the earlier Duke/Ponty group. Duke also wrote and produced the number one single "Sweet Baby" for his own recording with Stanley Clarke (The Clarke/Duke Project). Duke's special expertise was even tapped by such unlikely mainstream artists as Melissa Manchester and Barry Manilow. By the end of 1988, he had produced four songs for Smokey Robinson and several songs for saxophonist George Howard. George's other production projects included the number one chart hit "Call Me" by Phil Perry and several songs for Miles Jaye, vocalist Dianne Reeves, The Pointer Sisters, 101 North, Najee, Jeffrey Osborne, Take 6, Howard Hewett, Chante Moore, Everette Harp, Rachelle Ferrell and, most recently, Gladys Knight, Keith Washington, Filipino star Gary Valenciano, Johnny Gill and Anita Baker. George Duke made his debut on Elektra in February, 1985 with the Latin-flavored Thief In The Night. A second album, simply titled George Duke, was issued in August 1986, followed by Night After Night, George Duke's final release for Elektra. Through the years, along with his own releases and busy producing schedule, George has acted as musical director for numerous artists and television specials, including the Soul Train Music Awards (nine years), NBC's Sunday Night Show and Anita Baker (Duke took Anita and a 14-piece band to Washington D.C. to perform at the Kennedy Center for The Democratic National Committee). He served as musical director for Disney's concert to benefit the Foundation for Pediatric AIDS For Our Children (featuring an all-star cast that included Michael Bolton, Paula Abdul and Kris Kross) and Disney's Salute To Youth during the President's Inaugural celebration. In '92, he went to Spain to be music director for the largest guitar festival in history, featuring such artists as George Benson, Stanley Clarke, Larry Coryell, Paco de Lucia, Rickie Lee Jones and John McLaughlin. He also was at the helm for Legend to Legend with George Burns, Tony Bennett, Johnny Mathis, and others. In '92, George's Warner Bros. debut Snapshot captured the number one slot on the jazz charts for five weeks and generated the Top Ten R&B single "No Rhyme, No Reason." The following year, George Duke's Muir Woods Suite, a major orchestral piece, premiered at the Montreux Jazz Festival and, in 1994, Duke began work on Illusions. The beginning of '96 saw the release of his musical and emotional tour de force Muir Woods Suite, which was performed by a jazz quartet made up of George Duke (piano), Stanley Clarke (bass), Chester Thompson (drums) and Paulinho Da Costa (percussion) with L·orchestre National de Lille, Ettore Stratta, conductor. This was followed by more production with work on songs for Marilyn Scott, Al Jarreau and Natalie Cole. (George produced one-third of the songs on Natalie Cole's Stardust LP which was nominated for two Grammys and won one). George also wrote and produced the main title for The Malcolm and Eddie Show on UPN. In addition to doing his annual Soul Train Music Award stint in '98 and recording and releasing his "for lovers only" Grammy-nominated After Hours, his first completely instrumental album since 1975, he also produced three tracks for Dionne Warwick and one for Take 6. Next he hit the road, touring with Rachelle Ferrell, subsequently serving as music director for The Lady of Soul Awards and the Kansas City Jazz Festival. George also produced the Grammy award winning In the Moment CD for Dianne Reeves, and Rachelle Ferrell's Individuality, delaying completion of his own year 2000 solo release, Cool. The summer of 2001 finds Duke on the Tom Joyner Cruise with a combination vacation and gig. Live dates include a special performance for the 100 Black Men of AmerIca Convention in Atlanta. Off to Europe where Duke is artist in residence at the North Sea Jazz Festival featuring performances with Dianne Reeves and Rachelle Ferrell. A special performance of Muir Woods Suite with the Prima la Musica Orchestra form Brussels was amazing! Also various performances at the Montreux Festival kept George busy. One special moment was a tribute to Miles Davis featuring Marcus Miller, Christian McBride and Richard Bona on basses; Herbie Hancock and duke on piano and synths; Terri Lynn Carrington and Chester Thompson on drums; Wallace Roney on trumpet and Jeff Lee Johnson on guitar. Predictably, the energetic, unstoppable George Duke keeps moving from strength to strength, bringing invention, dimension and texture to music that is alive with personality and rich with artistry. In the case of his passionately performed Cool, which was nominated for an Image Award and a Grammy, Duke takes the lead on vocals adding presence and power to his ever-evolving view of others and himself. This deeply revealing and yet thoroughly accessible edition of Duke celebrates life, love…and the “Ancient Source." He hooked up with Kenny Lattimore to write and produce a Gospel song entitled “Healing.” George also enjoyed producing three tracks for the incredible Kelly Price for her first Christmas offering on Def Jam. The end of the year, he is quite busy scoring a film for Whoopi Goldberg and Danny Glover called "Good Fences," directed by Ernest Dickerson for Showtime. It is now available on DVD. George received the coveted Edison Life Time Achievement Award in Rotterdam in November. January 2005, George served as artist and MD for a special series of concerts in India featuring Al Jarreau, Stanley Clarke, Earl Klugh, L Subramanium and Ravi Coltrane. BET and MTV India documented some of the shows. Famous keyboardist that played on Michael Jackson's 'Off the Wall' died in 2013, Aug. 5 in Los Angeles, after being treated for chronic lymphocytic leukemia. 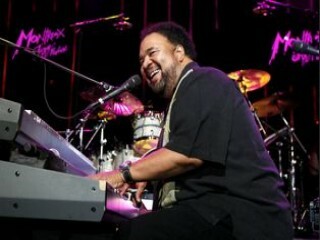 View the full website biography of George Duke.